"The biggest reason that kids should read comics and graphic novels is because they want to. Many young readers, when confronted with solid pages of text, become intimidated and overwhelmed and just give up. Give the same reluctant reader a thick, juicy graphic novel like 'Bone' or 'Castle Waiting' and they dive in eagerly, devouring every page. With many struggling readers motivation is the key, and comics are motivating." You can buy comics at your local newsagent,and borrow graphic novels from the library, but did you know there are online places where you and your kids can read comics for free? Recently I discovered the wonderful Grammarman website. Here you'll find comics with a grammar focus, as well as other comics to read and enjoy. If you have time, do check out the Free Stuff, especially this article about kids creating their own comics inspired by Grammarman himself. Sometimes it's motivating for children to see what other kids have created. At Grammarman, you can download a pdf of ten great children's own comics so you can keep, read and use them as inspiration. Kids can also post their work online at this wonderful website. Check out Grammarman vids on You Tube too. There is an Archie website, but it's more for watching than reading. Luckily, Grammarman has some Archie comics kids can read. Book Chook feather of approval. I LOVE Calvin and Hobbes! At Marvel Comics, there are some free sample comics to read. Here you'll find lots of cute Toon Book comics to read, and in different languages - French, Chinese, Spanish, English and Russian. If you choose the Read to me option, you can hear the words - a fun way to practise your French! 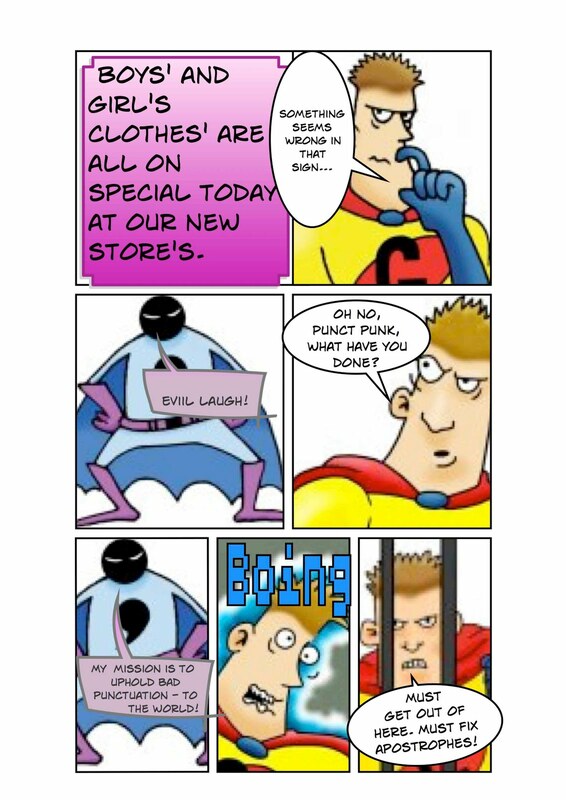 Toonpool is an online community of comic creators. Parental supervision is a MUST, but you and your older kids might find some fun reading or inspiration for creating your own comics here. A Written in Bone forensic mystery from colonial America at the Smithsonian. The Secret in the Cellar is a Webcomic based on an authentic forensic case of a recently discovered 17th Century body. Using graphics, photos, and online activities, the Webcomic unravels a mystery of historical, and scientific importance. Online sleuths can analyze artifacts and examine the skeleton for the tell-tale forensic clues that bring the deceased to life and establish the cause of death. If you or your children like comics, there's been an explosion in comics written for the web (rather than syndicated in newspapers.) One I love is Daisy Owl which has both an updated and archived collection page. I think it's suitable for under 12s but check it out yourself first. Another I enjoy is Order of the Stick. It's not for kids, but do show them the art work. It's almost achievable by people like me who are artistically challenged. One day, when I have time, I plan to follow the Inkscape tutorials for creating the stick figures. At Funbrain, you can read web books and comics, like Diary of a Wimpy Kid, Amelia Writes Again, Brewster Rockit, Silent Kimbly and On the Rocks. There are so many skills being practised when kids read comics. Just as with graphic novels, kids are involved in visual and print literacy, critical thinking, inference, decoding and comprehension. They are great as a focus for discussion about implicit meaning, and the way we deduce what has happened between frames. Above all, they will be some children's pathway to a love of reading. Wonderful! *clapping* I so enjoy a good comic! I think our students enjoy them as well. From reading to creating comics are a fun way for students to learn and express ideas. I haven't seen Grammarman, what a fabulous idea! Thank you, I think I will have to share this one on my blog! There's a LOT of great stuff on Grammarman, Kelly, so I hope you have time to check it out thoroughly. you can also connect with Grammarman on Facebook. I've been reading Benny and Penny, I know it should be for kids, but I like it myself. Thanks for the Marvel link, my little treasure will love having a blast with those. I do too. Same with Daisy Owl. Some comics I read seem to be trying so hard to have an "edge" or an attitude. I like the ones that are simple and have understated humour.